When you’re a living legend, your best moments can end up confining you. Once explaining why he never played the ballads that made him a legend Miles Davis said, "You know why I quit playing ballads? Cause I love playing ballads." Of course, the world is full of fans that "only like his/her/their old stuff" - an attitude deliciously mocked in the title of the recently released documentary of LCD Soundsystem’s swansong Shut Up and Play the Hits. If anyone knows about the precarious place between audience alienation and artistic stagnation it is Jimmy Cliff. As an active recording and touring artist, best known for his work in 1971, Cliff has spent the majority of his life as a roots reggae icon with occasional attempts to adapt his style to current trends netting mixed results. While Cliff could easily ride out his career performing "Many Rivers To Cross," "Sitting in Limbo", and a collection of other hits in a Vegas style music review, thankfully, he has chosen not to phone it in. 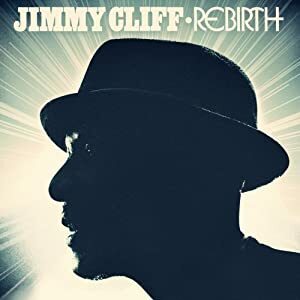 For his latest album, Rebirth, Cliff enlisted the services of punk rocker and roots reggae enthusiast Tim Armstrong; resulting in solid album that confidently, but not self-consciously, sets Cliff in his proper place in popular music history. The collaboration between Cliff and Rancid frontman Armstrong initially began with Cliff soulfully pouring is heart out, in an extended nyahbinghi drumming session. The energy generated in this moment is carried throughout the record. Armstrong’s influence is most evident on the album’s two punk covers – Rancid’s "Ruby Soho" and The Clash’s "Gun of Brixton". There is a long established link between punk rock and reggae, with rebel sounds imported to London by Jamaican immigrants serving as a new model of music as social change for disillusioned white youth in 1970s England. Beginning with the Clash’s cover of Junior Marvin’s "Police and Thieves" in 1977, countless punk bands have covered Reggae classics. The list of reggae covers of punk songs is much shorter. "Guns of Brixton" (which is built on background drumming taken from Cliff’s first session with Armstrong) is particularly noteworthy in light of last summer’s ­­­riots in London as well as the ongoing uprisings in the Arab World. Armstrong’s biggest contribution comes not from written material, but from production. There is an overall roughness to the album that gives it an overwhelming feel of spontaneity and authenticity. In the past Cliff’s sweet, intimate vocals have sometime undercut harder edged lyrical content. On Rebirth, Cliff’s beautiful voice has plenty of grimier foils – ad libed vocalizations, raw drum timbres, and a wide variety of keyboard and percussion instruments that balance, support, and enhance the overall character of a song. Even Cliff himself gets in on the act. On the track "Cry No More", after an intro that is reminiscent of the opening to "Many Rivers To Cross", Cliff chokes out the chorus in a raspy falsetto. Rebirth is unmistakably a roots reggae album - bass lines bounce, chords chunk, and rim shots crack with excitement. Tracks like "Bang" and "Rebel, Rebel" are reminiscent of classic ‘70s roots anthems along the lines of Culture or Max Romeo & The Upsetters. On "Outsider", Cliff proclaims his commitment to lifelong rebellion over a Stax-style rocker that underscores the influence of ‘50s and ‘60s R&B on Jamaican soundsystem culture. "Reggae Music", is a simmering track that takes listeners on a personal tour of the history of the music through the eyes of a man who was there. Rebirth is one of Cliff’s strongest albums to date; which is saying something for someone with a track record as long as his. The "just do it" ethos of the album makes a few of the songs’ lyrics feel a bit forced and unfinished. There are plenty of great additions to the Cliff songbook like "Cry No More" and "Children’s Bread", but lyrically, some of the songs come off a bit underworked. On the other hand, the raw energy of a track like "One More" seems, in part, to feed off the feeling of pure emotion grasping for words. Throughout the album, Cliff and Armstong strike a balance between history and innovation. We see not just what Cliff has been, but more importantly, what he is and always will be. In a summer of endless political ads and triple digit temperatures Rebirth certainly offers listeners great solace. On a personal note: it is great to see my young boys having such fun, rocking out, to music with such deep roots.